Re-Inventing the Chair: Are you Sitting down? Ah, perfect. A walk in the forest. Trees. Sky. Delightful quiet. A Red Chair. Wait…what? How charming. 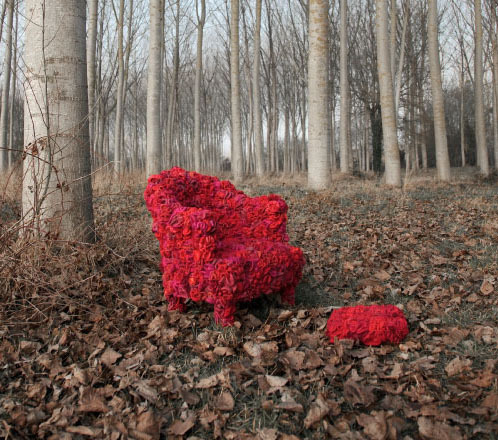 This chair presented by the designers in Holland who explore such things, are reminding us that things are not what they seem. Sustainable fabrics, textiles and unusual presentations bring things like chairs, to our attention. Why not stay a while and bring your favorite book? This witty piece is resting in a quiet forest but it might as well be in your living room. We love the color, and its inviting character. So, why not re-invent the chair? Make it witty, sustainable, and a bit bossy. We think its really, perfect for Valentines Day, we’re just not sure how to wrap it up…Happy Sustainable Valentines Day! VERTE EDITORS…who are lost in the woods…but you can write us if you dare. NOTE: designs are from Holland and part of a February 2012 Textures and Textlies show.